In this edition of Makers' Hangout I interview Kara Lagniton of Karagami Studio about her experience at MTO 13, a stationery market fair in Hong Kong. MTO 13 is a Stationery market in Hong Kong that highlights masking tape (or washi tape.) MTO which stands for "Masking Tape Only" held its 13th edition on the 25th of May. I am happy to report that a stamp maker based in Manila, Kara, was one of around 75 merchants who participated in the stationary fair. Kara: MTO 13 is this craft fair in Hong Kong. First of all, as you've read on my blog, I was super scared to join because I've never really- it was my first time to go out of the country and sell my work. Fortunately in real life, not the website, and not online and that was really scary. The day before flying out to Hong Kong I was super super scared that's why I didn't post about it online. I only posted a few weeks after [the entire event.] I was really scared the day before, it was like, I wanted to throw up. I arrived a day before the actual event so that I could prepare and believe it or not I wasn't fully prepared that I had to carve a lot of stamps to sell, which I don't recommend to anyone for you to do. Prepare way before the event! I had a lot of work on my hands so I couldn't prepare so much. When I got to the actual event I felt, at first of course I couldn't remove fear. It was there, it really was there. You see all the artists, you see all the other booth owners there and how they were setting up their tables, all of their designs, they had so many things to sell they has stationery, notebooks, etc. [I was feeling] a mix of excited and scared because I was the only Filipino seller there. I didn't really know anyone. But it felt like such a welcoming community as well so that was basically the experience. I was excited and scared at the same time. But for the first day more scared but the second day more excited and not so scared any more. How is the crowd different from Manila, apart from the language barrier? K: Actually it wasn't so bad because almost everyone spoke in English. I didn't really have much of a language barrier. Although I did experienced whenever they ask for the price or a certain item they would speak in Chinese and I would just tell them "English only please". The crowd itself, Hong Kong is super active in supporting the art scene and I guess the craft scene also. There were just waves and waves of people coming in and looking at everything. And one of the things I observed based on what I experienced here, in terms of the people who join or participate in these craft fairs, here [in the Philippines] it would usually be young girls or maybe the aunties who are into journaling / planners but rarely do I see a whole family going to a craft fair here. Versus in Hong Kong, because it was mothers' day weekend also, a lot of the attendees were moms, dads, and their kids, its a real family activity. Did you get meet any artists you look up to at the fair? K: I did. I've been following this Hong Kong Artist, Carriedraw / Carrie Illustrations. I would always ask one of my group mates in this planner community I am part of if she can buy Carrie Illustrations for me because she's always flying to Hong Kong and she's also the one who recommended that I join the craft fair in Hong Kong. So I was able to meet her and was able to buy from her, she even made a portrait of me and my dog. I met briefly because nobody could really leave their booths. We're all just manning our own booths so the only time I got to meet her was 15 minutes before closing time of the fair so it was really fast. Do what you want to do even when you are super afraid. From this experience what would you say is your biggest take away? K: There were a lot to be honest. I had to process the whole thing days after I came home but the biggest would be do what you want to do even when you are super afraid. I know most of you guys, fear is such a natural thing to happen. Especially if you're trying something for the first time in another country where you don't know anyone. The fear is magnified but like I said earlier, the fear can only last you so long. Like I was scared only on the first day but on the second day I was just enjoying being there at the fair meeting different people, meeting different artists and appreciating your work. Even if you are scared or you're starting out with your hobby and you want to go into business. Even if scares you, you even if just want to share what you've done even if its so scary. You have to do it. And then you'll have to see its not so bad after all. That the fear will eventually go away and you get to do what you love to do. If you had to do it again, but in another country, would you be up for it? K: Oh yeah of course, actually I joined MTO in Hong Kong on impulse to be honest. I only learned about it in April that's why I wasn't super prepared for the event and I had to carve my stamps in Hong Kong. So really couldn't claim that everything was made in the Philippines because I had to do it in Hong Kong. I did it on impulse but I've been wanting to do fairs in Japan, in the States, so I thought before I go to those big events in other countries I should probably try doing a small one in a nearby country- mga 1 hour flight from Manila kaya pa. What if I go all the way to the States its a bit too far to come back home. If I remember correctly you've had the opportunity to a visit craft fairs abroad? K: I've been to a craft fair in Sydney. I've dreamt of visiting craft fairs in Japan like DesignFesta which I think is an art fair and also planner convention in New York. Mostly I find them online and I've been subscribed to these events first for so many years and I've always wanted to join but it feels like a lot of preparation and pressure. Most fulfilling experience is getting over the fear of failing in another country. Realizing that there was nothing to be afraid of after all. I received compliments from locals that meant so much to me since I know that stamp carving is not a rare form of craft in HK. Another one is getting my very own washi tapes, which I have always wanted to have! What was the main challenge in participating at MTO 13? Most of it had to do with getting over fear because so many things could go wrong like getting lost, getting rejected, not selling a thing at all--none of these happened though. Another challenge was transporting my items and choosing not to bring my usual booth setup display coz it was too heavy. I didn't feel like I was in my A-game in terms of displaying my items well, which meant my work had to be really good for people to buy. How does the experience at MTO 13 differ from selling in local craft fairs? The pressure to sell of course is magnified because I spent more than I usually would in booth rent plus travel. But in terms of vibe, I took away a lot of tips even just observing the way other people set up their booths, the way they displayed their items, the freebies they gave away to attract people. It felt like I was surrounded by creative business gurus and I was their student. What is your greatest insight or learning from this experience? That you can do whatever you put your mind to, even if you do it with fear. I realize my work isn't so bad, I just need to grow more courage and confidence in sharing this thing I love to do. I think I could have stretched that interview but the realization that my hosting skills are very rusty dawned on me towards the end of the interview yikes. 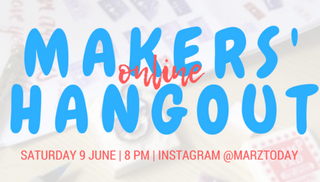 I too jumped into this Makers' Hangout because this is something I really want to do for the maker community. Making is one thing, getting the support you need from the community is another. 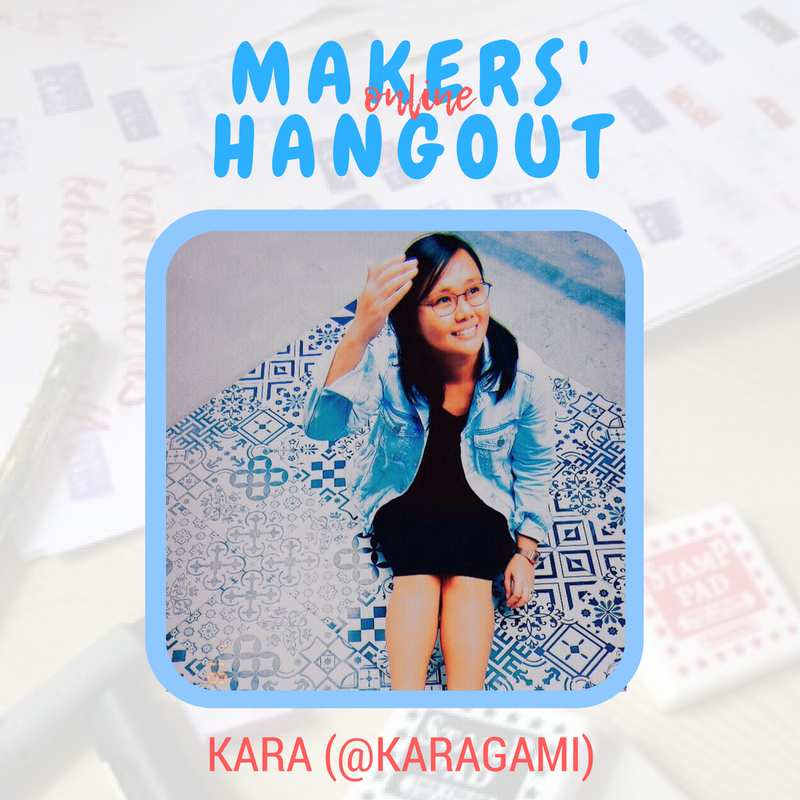 I hope you makers are also about to take a leap into doing what you love, as Kara shared with us in this hangout. Discussions with makers continues on the next Markers' Hangout.